Mother Do You Think They Will Like This Song? 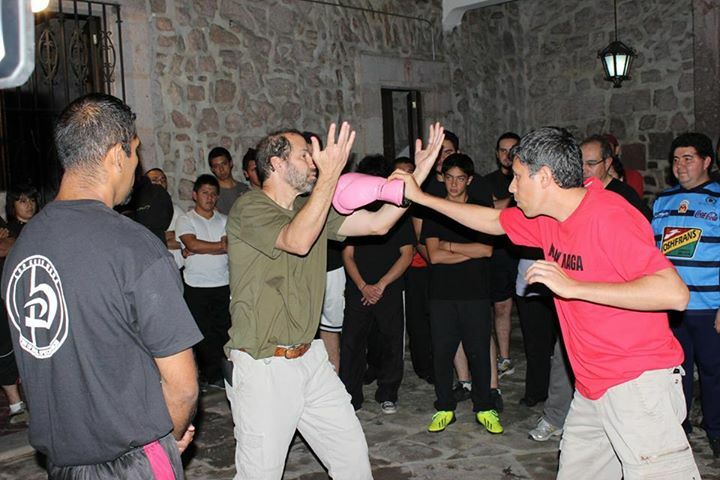 Moshe teaching the IKI Krav Maga method, Morelia, Mexico, with IKI Instructor Cristian Vasquez, 2014. Realistic Self defense for violent situations. I was teaching a seminar, first time group. Pretty tough crowd. They had been training for some time in another style of Krav Maga, they were accustomed to other ways. At first they were resistant to my ideas. My ideas went against what they were taught to believe, "Thought Control". I could feel their resistance to change, to emptying their cup to make room for new knowledge. The host asked me about a particular knife defense. Did I know this defense? Was I familiar with it? Yes, I knew it well. But I was not teaching it and was not about to teach it. I learned it, was tested on it, and taught it for many years and then dropped it. I discarded it as I came to the conclusion that it was not effective. I found it highly dangerous and impractical. I believe it will not stand the test of reality. My host suggested I teach it. He said the group liked it and this would help "break the ice". I should show them a familiar technique; an old favorite, something they knew well. I do not care. I do not care if what I teach is popular. I do not care what others think. I only care that it works. I only care that it will save your life. I only care that you get home safely. Hey you! Can you hear me? "Mother should I trust the government?" I do not whom we can trust anymore. I do not care if I sell tickets. I am not designing a Krav Maga program of the most popular Krav techniques, I am not releasing a "Greatest Hits" album or "All Time Favorites". Leave that to the other guys. I have to be the one with the unpopular truth. Hello...is there anybody out there? Is there anyone at home? I can ease your pain. Just the basic facts. This is about reality. This is about saying what I think. He told me to play what I liked at home on my sofa. You have to please the crowd. I did not last long in the entertainment business. I am not an entertainer, I am an educator. I respect those who play their own music, who follow their own heart. Let your own music lead you. The results will be real. Do not let others tell you what to dream. Be yourself. I have stopped trying to please everyone. So you think you can tell reality from falsehood? Can you tell heaven from hell? Do you think you can tell? I have stopped asking "Mother will they like this song?" I play my own music, I write what I feel, I teach what I believe in. I prefer a minor role, or any role, in the world of reality then a leading role in a world of fantasy and falsehood. Tour and Train Krav Maga Israel Experience. Absorb Krav Maga from the source. Israel, the home of Krav Maga. Spend two weeks with us, immerse yourself in Krav Maga and come home a richer person. Understand the core of Krav Maga. Krav Maga; As real as it gets. Learn from real life confrontations. Learn from the Israeli experience. Dates: March, June, November each year.